Alumna Christina Irwin, who graduated with a BA (Hons) in History and Philosophy of Art in 2016, has recently gained a position on the Graffiti Project, part of a Canterbury Journey project funded by the Heritage Lottery Fund and based at Canterbury Cathedral, which is currently seeking new volunteers. 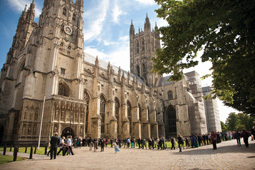 The Canterbury Journey aims to engage new, hard to reach and diverse audiences through a volunteer programme that develops and interprets Cathedral collections. The Graffiti Project is an initiative that engages volunteers in recording marks found in the eastern crypt, etchings of lost voices from the medieval world. The graffiti tells us of religious devotion, fear of damnation, of love and of humour. Unlike contemporary graffiti or street art mostly seen as anti-social vandalism, medieval graffiti incised or scratched through vibrantly painted surfaces stood out clearly and would have been easily noticed suggesting that these images were totally accepted, these marks have meaning and function. There are prayers, devotional and votive, memorials, ritual apotropaic marks, compass drawn geometric designs, and five-pointed stars or pentangles, the symbol representing mathematical perfection in Ancient Greece, in abundance. There is relatively little published material about this subject and the imagery of the medieval parishioner is steeped in folklore and superstition, challenging the search for meaning. The many voluntary opportunities can be found here.